Net Neutrality Rules: FCC Publishes The Repeal Order, Lawsuits Begin : The Two-Way The agency has formally published the order to undo net neutrality rules, which opens the door for lawsuits by state attorneys general and others. Congress could also decide to block the repeal. Protesters Sammi LeMaster and Katherine Fuchs carry the top of an alarm clock display that reads "Net Neutrality" after a demonstration at the Federal Communications Commission on Dec. 14, 2017. Senate Democrats have also been pushing for a special congressional vote to block regulations from going into effect, but have so far been one vote short of overcoming the Republican majority. A similar vote would also face a very high hurdle in the Republican-controlled House of Representatives. It's a principle that Internet providers should be neutral gateways that provide equal access to all legal web content. Read all of NPR's coverage of the topic here. The pushback follows the December vote by the Republican-led FCC to repeal Obama-era net neutrality rules, which limit the power of Internet service providers to influence loading speeds for specific websites or apps. The repeal can't take effect until the Office of Management and Budget completes a review of the change. As NPR has reported, "the rules, put in place in 2015, banned cable and telecom companies from blocking or slowing down any websites or apps. They also prohibited broadband providers from striking special deals that would give some websites or apps 'priority' over others." The FCC's repeal will allow both blocking and throttling by Internet providers, leaving one requirement intact: that broadband companies — such as Comcast, Verizon and AT&T — have to disclose to users how they handle web traffic. FCC Chairman Ajit Pai has said the Federal Trade Commission should then police violations. The FTC does not pre-emptively regulate them. Broadband companies have said they do not intend to block, slow down or prioritize any web traffic as a result of the FCC's repeal, arguing that it's not in their interest to upset and potentially drive away subscribers. 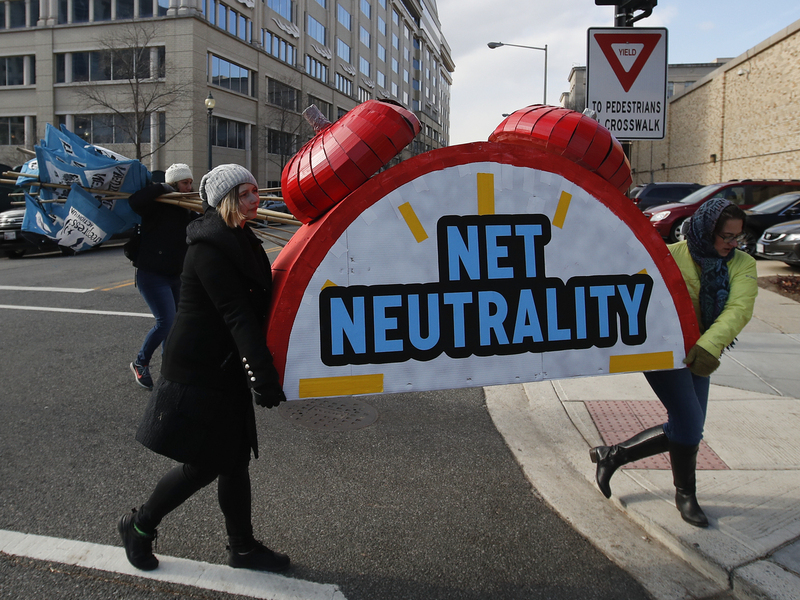 Nevertheless, net neutrality supporters say the repeal will allow broadband companies to act as gatekeepers of how people use the Internet, for example empowering Internet providers to prioritize their own video-streaming services over competitors'. A coalition of more than 20 state attorneys and several advocacy groups had already begun the process of challenging the FCC in court in previous weeks. Now that the rules are officially published, the supporters of net neutrality are starting to re-file their formal lawsuits. The legal challenges have the support of groups and Internet companies including the ACLU, Fight for the Future, Public Knowledge, Reddit, Vimeo, Tumblr and Mozilla. The Internet Association, which represents companies such as Google and Facebook, has also opposed the FCC's repeal of net neutrality. Editor's note: NPR's legal counsel had filed comments with the FCC on behalf of the public radio system, opposing the repeal of the 2015 net neutrality rules. You can read them here. An earlier version of this story said the repeal of net neutrality rules would take effect on April 23, but the process has no official timeline for now.